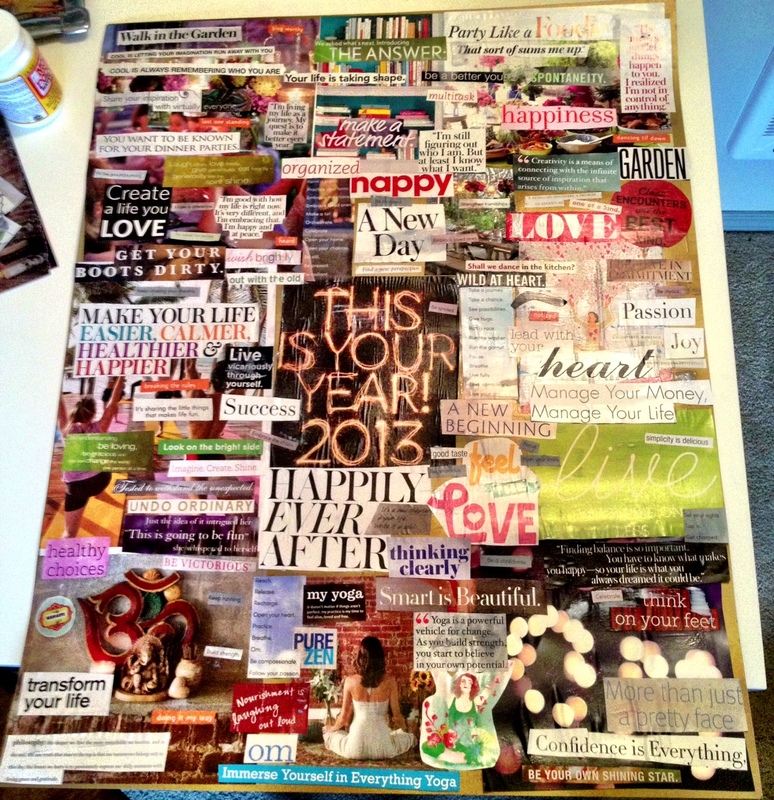 I created my first Vision Board almost five years ago…I think this was right around the time The Secret was at its height in popularity. And though I never read or watched it…everyone knows the basic principles… you have to put out there what you want back. AKA go boldly in the direction of your dreams… Miraculously I have moved this poster board with me 4 different times ( clearly I have issues with getting rid of things). 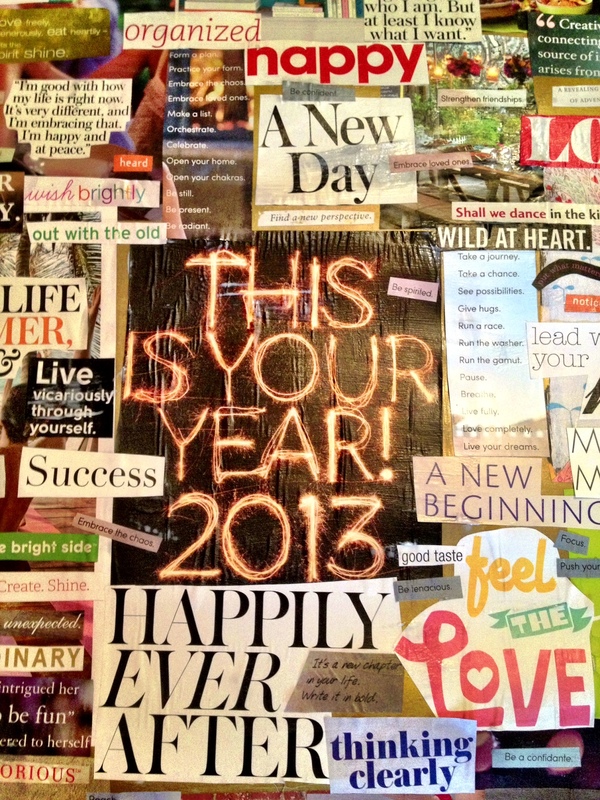 Currently, that original vision board lives in my storage shed… but a few months ago when I stumbled across it, I realized it might be time to make a new one. After all, my life has been in a huge transition period, and also just about everything on that original board I’ve already accomplished. Time to start new! This time around, I’m not as worried about specifics, as I am trying to manifest a direction I’d like my life to go in, and focusing on the things I value and things I want to incorporate more of into my life. Creativity, Love, developing my yoga practice, creating a home… These last few months I’ve had to really take a step back and completely revise what I want to do with my life and kind of start from scratch as far as how I identify myself and what goals I want to work towards…it’s a bit challenging to manifest specifics when life seems to be going in every which direction… so I’m going a little more abstract… and what I found was that as I was searching for materials, I was less drawn to pictures, and more drawn to words… which as a writer, I think this makes a lot of sense. And I think this is mostly true… for me going through old magazines and finding those few things that jump off the page is really therapeutic. 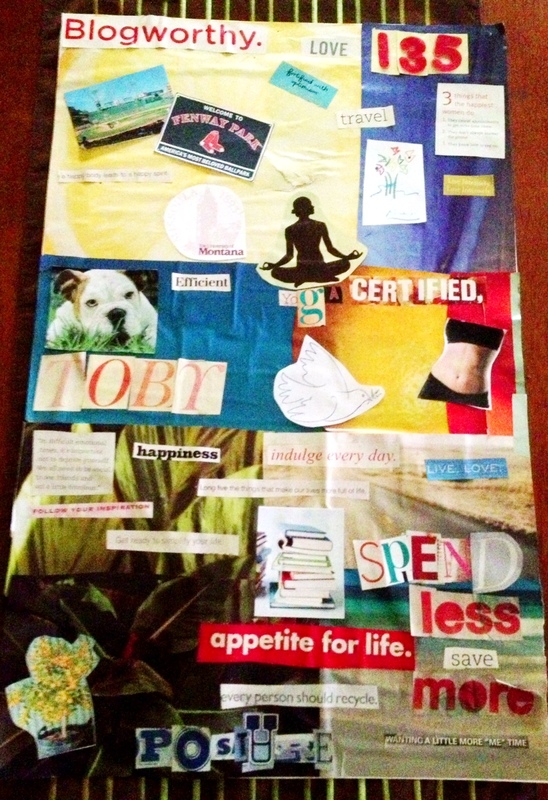 And I think that is probably a huge part of the vision board, is trying to focus in on what things resonate with you, and taking the time to cut them out, consciously making a decision that “yes, this is something that I want to focus my energy on.” Cutting stuff out, and finding those key pieces is the hard part… gluing things together is where it gets a little more creative. 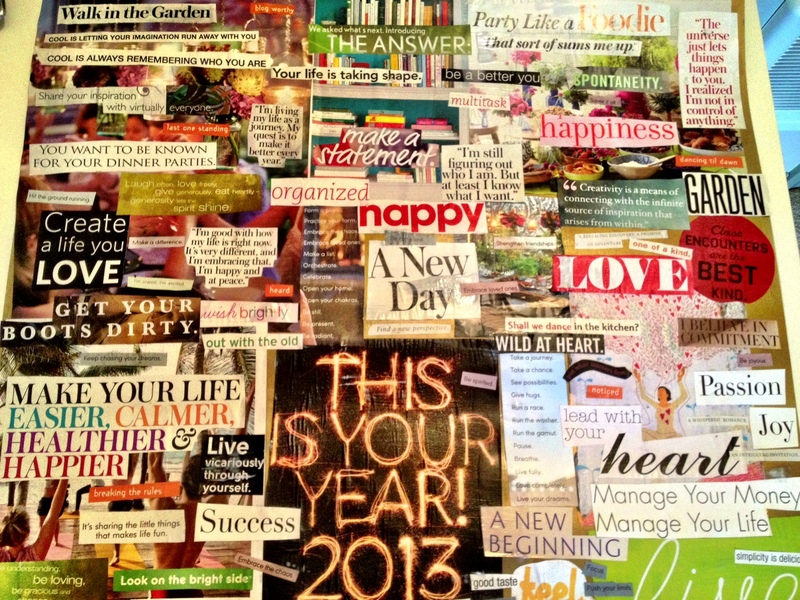 I have been assembling collage supplies for years (just ask my parents how many magazines I have refused to let them recycle/ how many folders of things they had to move out my childhood home.) 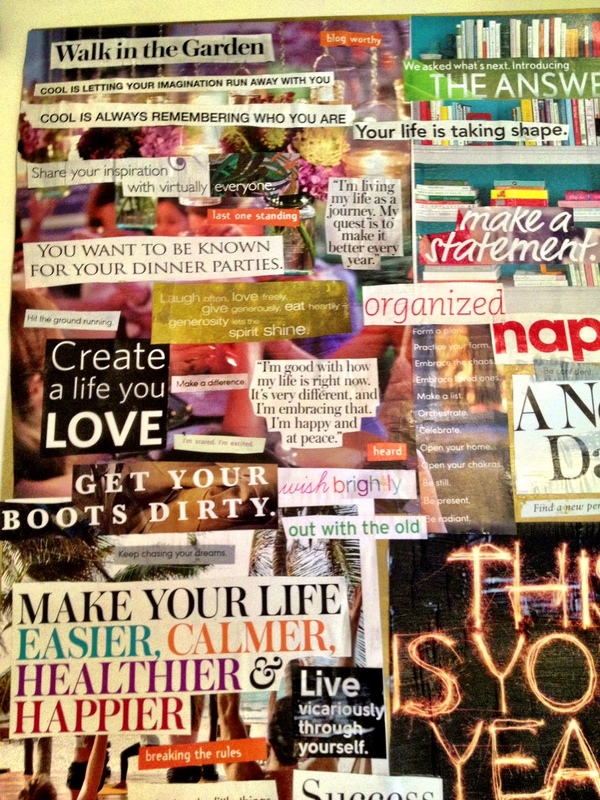 I started making collages when I was in high school… I even have a collaged bookshelf sitting out in my garage… (and that has moved with me 11 times… 11. It’s not even my aesthetic anymore, and wouldn’t really fit anywhere in my home, but I cannot part with it! ) and today I went through a few of the folders just making sure I didn’t have something perfect for my vision board squirreled away. It was pretty hilarious to see some of the stuff I’ve cut out over the years. Some things are very much what you would have expected a 15-year-old to hang onto (I really can’t even tell you how many magazine cut outs of Prince William there are… it’s pretty sad) but some of the stuff just made me think “yup, I’ve always been an old soul.” And then there was an awkward moment when I started to sift through things and realized that stuff I had cut out of fashion magazines is actually now currently living in my closet… I guess manifestation really does work… because the amount of things I had cut out that I now actually own is a little creepy. 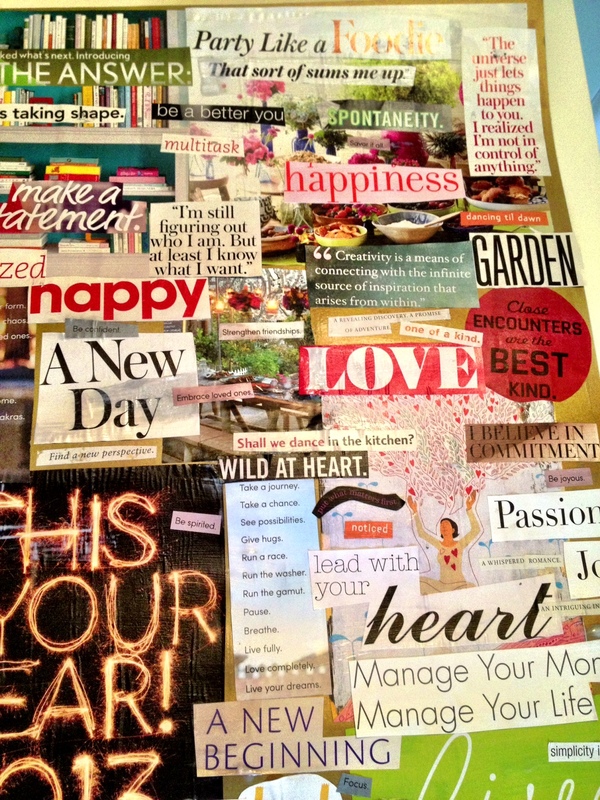 I literally have over 10 years of collage materials (condensed into one expandable folder, for the most part), and I am happy to say, that today upon the completion of my vision board, I actually recycled all the old magazines I had around the house. I’m slowly purging… it’s the little victories in life. Once I had everything cut out, I tried to organize the pictures and words into categories or pods. 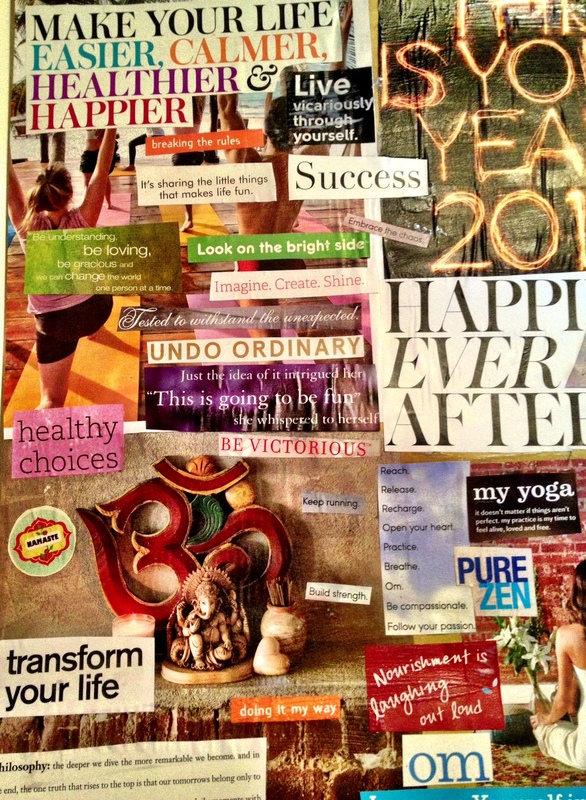 There are basically 3 main themes running through the board… Yoga, Love, and Everything else (meaning, working on me, life, motivation, goals etc.) And I tried to arrange them on the board in a way that they were concentrated in their groups, but also connected with each other, so it had a natural flow… And here it is… here I am, putting these thoughts, and this energy out into the universe, and I’m looking forward to seeing what comes back as I’m starting this new chapter in my life. It is definitely a little busy, so I tried to get some different sections so you can see more of the details.